The Giffords Law Center to Prevent Gun Violence released its annual analysis on Friday, days before the first anniversary of the shooting, which killed 17 students and staff members at Marjory Stoneman Douglas High School in Parkland, Florida. 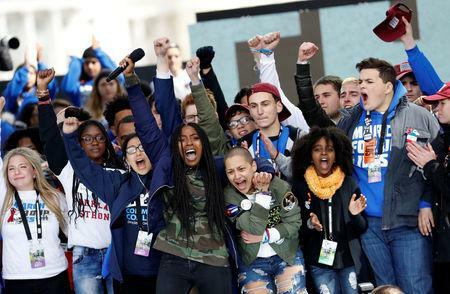 Overall, 10 states improved their grades, starting with Florida, which went from an "F" to a "C-minus" after passing a package of laws weeks after the shooting. Vermont passed the first gun safety laws in its history, the center said, going from an "F" to a "D-minus." The state, where a large proportion of residents live in rural areas, now requires criminal background checks for all purchases and allows for the removal of firearms from dangerous individuals and domestic abusers. It also banned high-capacity ammunition magazines. The NRA did not immediately comment on Friday's release. The center was established more than 25 years ago and took its current name after merging in 2016 with the gun safety advocacy group founded by Gabby Giffords, the former Arizona congresswoman who was wounded in a mass shooting in 2011.